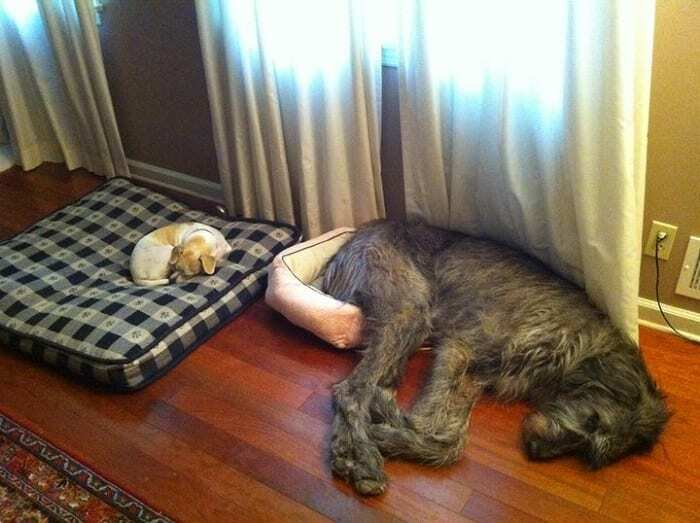 People love their dogs, no matter what size they are. Irish Wolfhounds, though, are a whole different animal — literally. 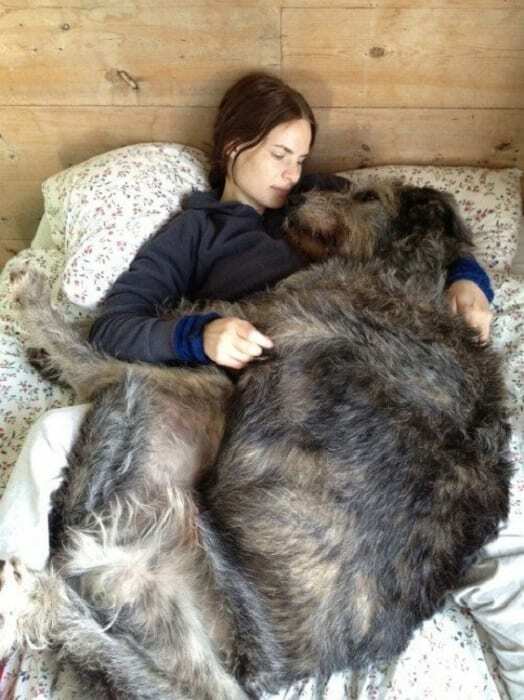 These dogs are so enormous, you can hardly believe they actually live in a house. But they do, and their owners love them just like any other pup. There’s no getting around their size. 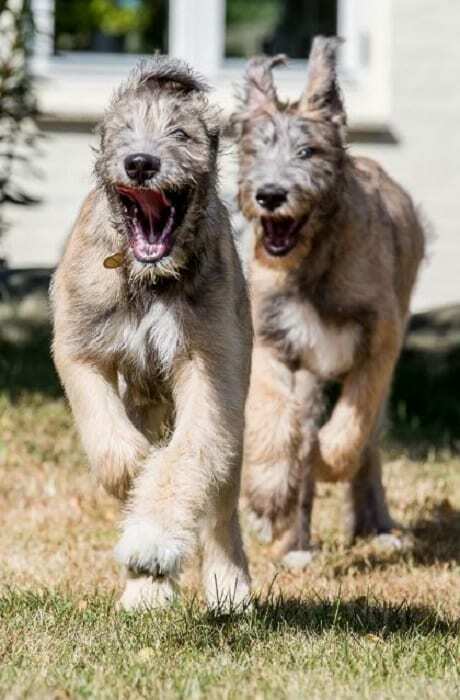 Irish Wolfhounds routinely reach over 100 pounds, with the males weighing up to 120 pounds and the females usually staying around 105. They can also get up to 32 inches tall. By the way, if you were wondering where they got their name, it’s not just that they look a little bit like wolves. That’s right, they were also used to hunt wolves back in the day. Think about that tonight while you’re falling asleep — people used to hunt wolves once upon a time, and they depended on these massive dogs to do it. 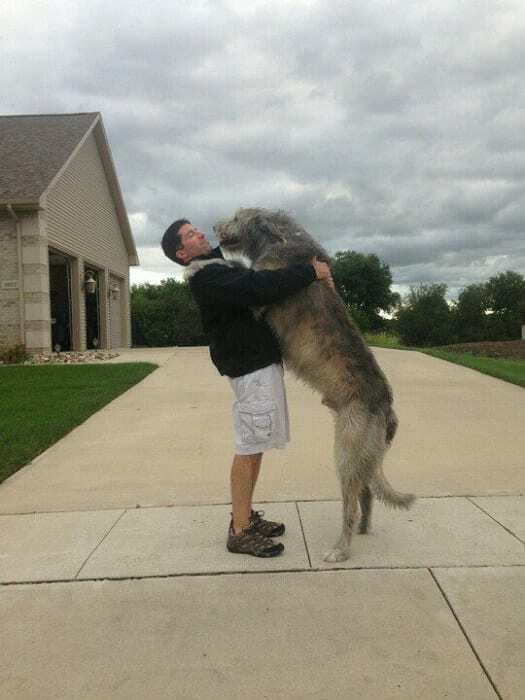 Irish Wolfhounds have been around in Ireland for well over 1,000 years. Though they look pretty scary, they’re actually known for their peaceful, gentle personality. To the world, they are frightening animals that make you want to hide in a back alley. But to the owners who love and care for them, they’re family. 1. That’s one way to deter thieves. I count six separate snouts pushing their way through this door. That’s between 600 and 700 pounds of dog! Though it’s funny to think of these happy guys greeting their family like this at the end of a long day, it probably wouldn’t have the same effect on potential burglars. 2. This picture was shared with a heartfelt memory. This poster said their mother was dying of ovarian cancer when this photo was taken. To her delight, her Irish Wolfhound was able to be with her. The big dog’s presence and snuggles gave her a huge amount of comfort in her final days. Seventeen days after she passed away, her loyal companion did as well. 3. Here’s one way to have some fun with your dog. 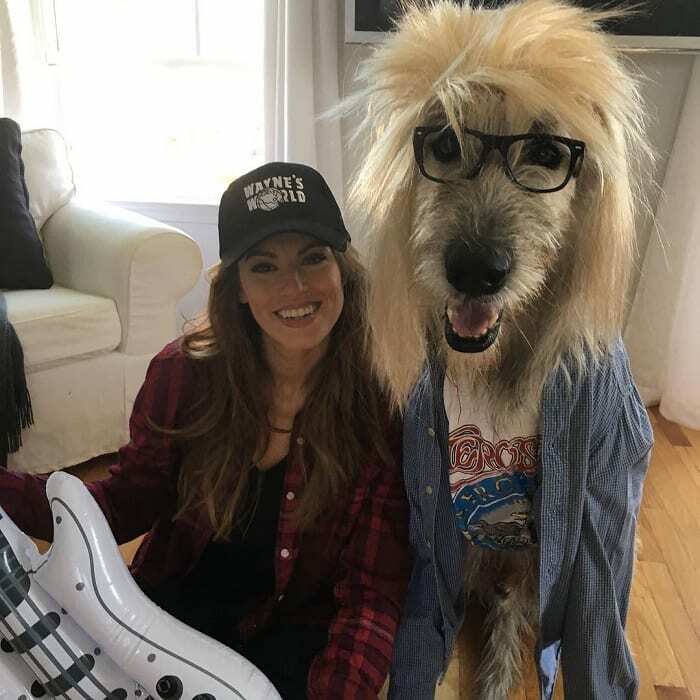 Plenty of people like to put their furry friends in costumes for Halloween. Whether the dogs like it is another question. This lady had an incredible coordinating costume with her gigantic puppy. 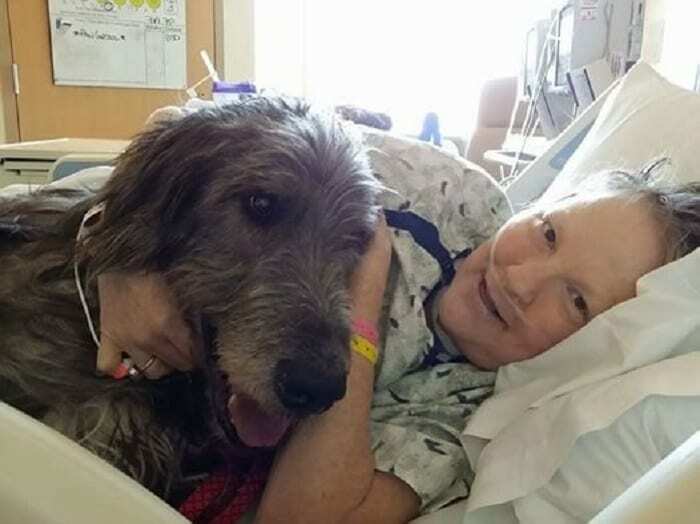 What’s amazing is how patient he looks — he’s just happy to be with his owner! 4. Turn back, you monster! 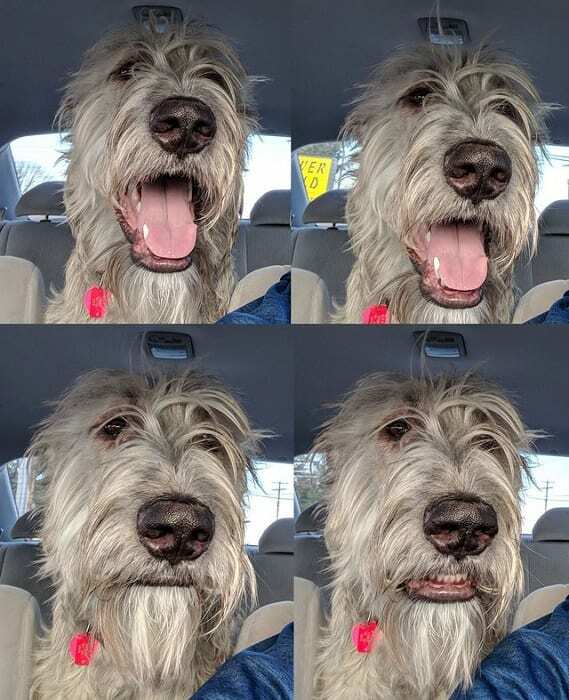 This pet owner got a hilarious series of photos showing their dog’s train of thought as it realizes they’re not on their way to a fun day at the park. In the first picture, he looks so excited, then uncertain, and finally, completely disappointed. Who could possibly say no to that sweet face? 5. We can tell which one is king of the castle. These two dogs each have their very own doggie bed chosen specifically for them and perfect for their size. This little guy is having none of it today. 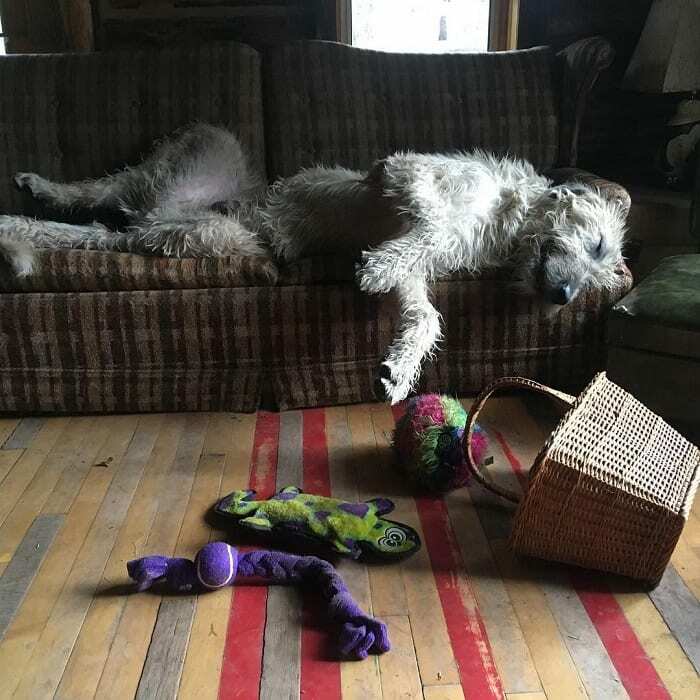 Now that he’s lost his bed, this big Irish Wolfhound is taking lemons and making lemonade. If only something fit on the bed other than his backside! 6. They may be different sizes, but they’re two peas in a pod. Which of these sees itself as the supreme defender of the house and the family? We bet it’s the Chihuahua. 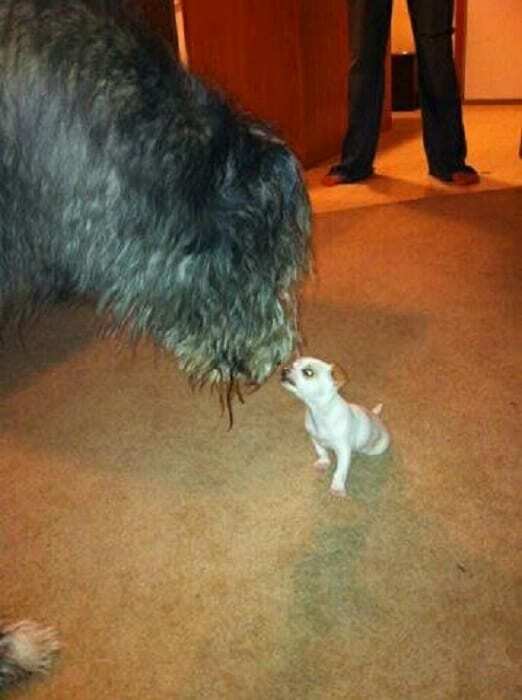 That Irish Wolfhound might weigh over 100 pounds but the Chihuahua thinks he’s the biggest kid of the block. If you mess with his family, you mess with him. 7. Where does it start and where does it end? Animals on the internet have become famous for “If I fit – I sit,” but this isn’t exactly the same. 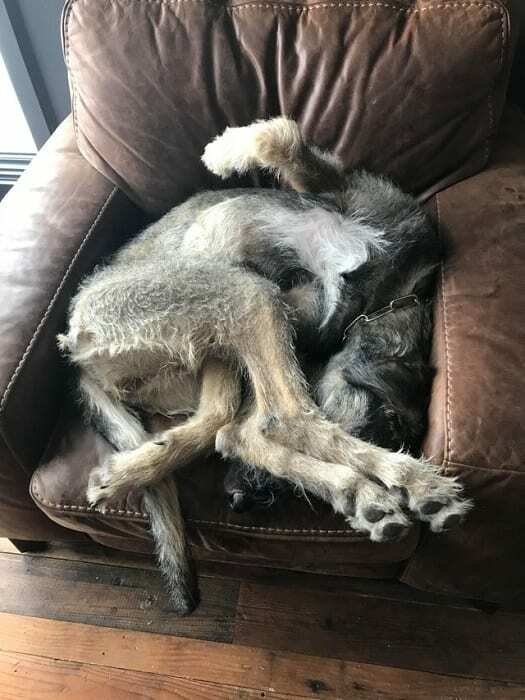 This dog barely fits on the chair, much less in a crazy position like that. But she doesn’t mind. This is her chair, and she’s going to sit in it any way she wants. 8. 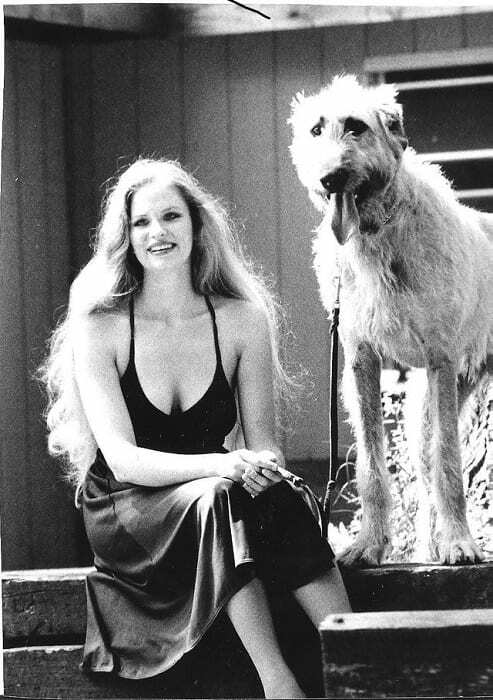 Everyone had long hair in the 70s … even the dogs. This poster found a picture of their grandmother with her Irish Wolfhound circa 1974. What an amazing picture to have in a family album, especially since she probably has very fond memories of her old pup. As for Grandma, she was beautiful during the era of disco! 9. When walking in the park, always keep a couple Dachshunds on hand. 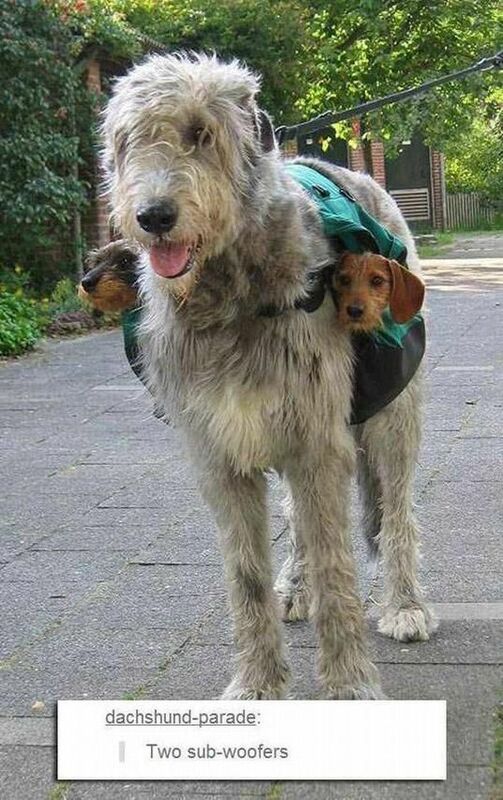 This guy is using his size to act as a public transport service for smaller dogs. He probably barely feels them bumping along on his sides. Meanwhile, they get the pleasure of going on a walk without having to put in any effort. The services in this city are great! 10. Friendship has no eye for size. These two guys are on their way to what will become a long and happy friendship. They’re both new to the home, and they clearly come from different backgrounds. But they’ve discovered that there’s room on the doggie bed for two, and that’s a start! 11. 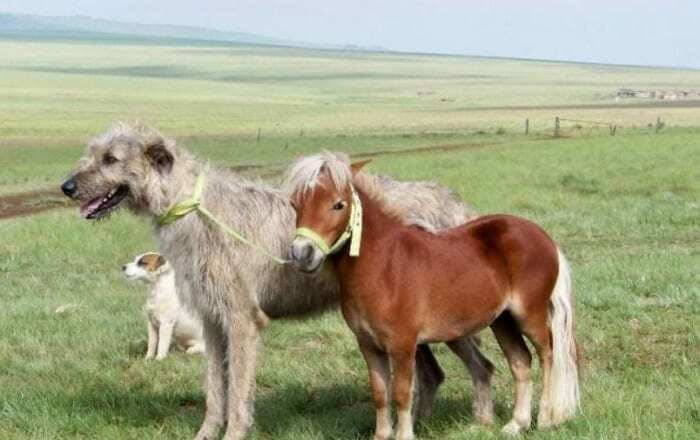 The dog is bigger than the horse! 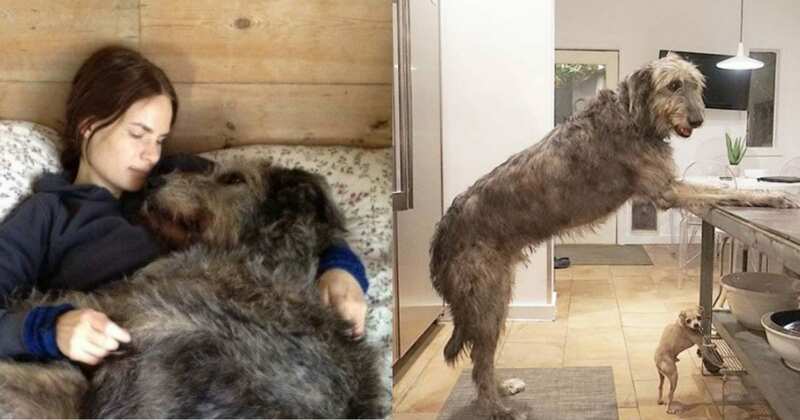 This Irish Wolfhound looks like he’s at home right where his ancestors came from. He’s got miles of land to run around, and friends to share the experience with. Of course, none of them are as big as he is. Hopefully, that pony will be able to keep up. 12. What an awesome and mighty hunter! 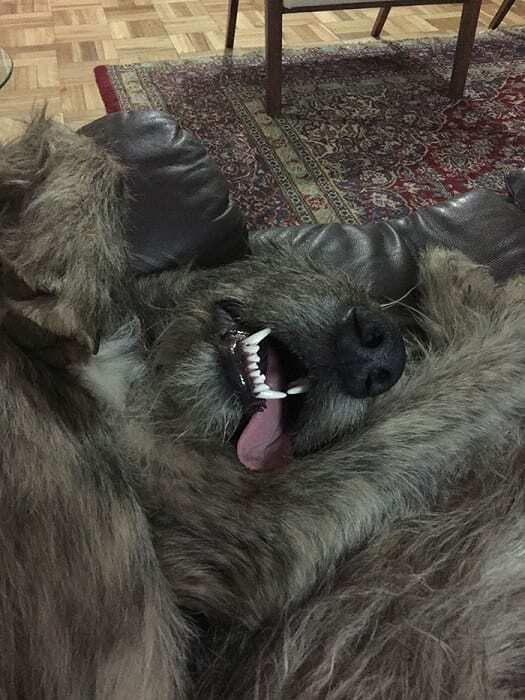 Sure, Irish Wolfhounds were bred to go up against one of nature’s most vicious killing machines. Yes, they can get larger than many humans and as tall as children. And yes, sometimes they need a teddy bear to snuggle with while they go to sleep. Do you have any more questions? This good boy doesn’t need to stand up to give his owner a kiss — he can almost see her eye-to-eye while sitting on the ground. But as big as he is, he’s a gentle giant who gives the best kisses. He’ll probably be sitting at the door waiting for her when she comes home. 14. Tiny kitten thinks he’ll stay over here. This sleepy dog i\sn’t alone; he’s being observed by a tiny little feline companion. He’s in the middle of a nap, so he’s yawning big and showing off all his teeth as well as his big pink tongue. 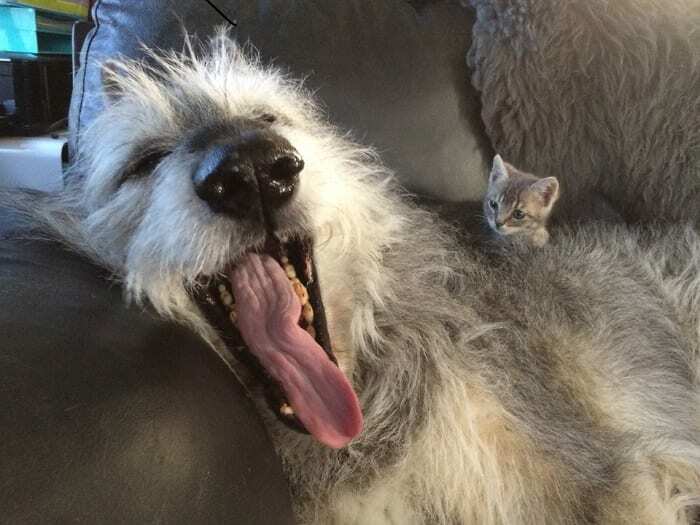 The kitten doesn’t look nervous, but we can’t help but notice that the dog’s mouth is big enough to fit a couple kittens in there. 15. It’s hard to get comfortable when you’re this big. 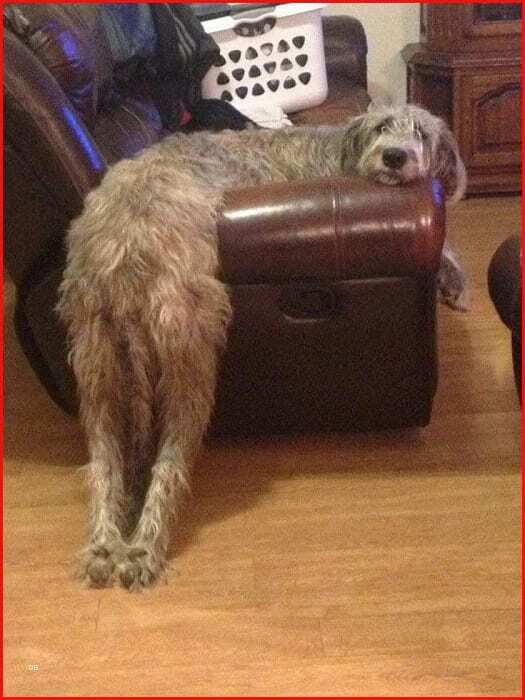 This big Wolfhound is making the best of what he has and stretching out on the arm of the couch. Of course, if he’d just get up onto the couch properly, he’d probably fit just fine, but oh well. This is his solution and the way he’s going to stay until he’s good and ready to move. 16. What the heck is this? 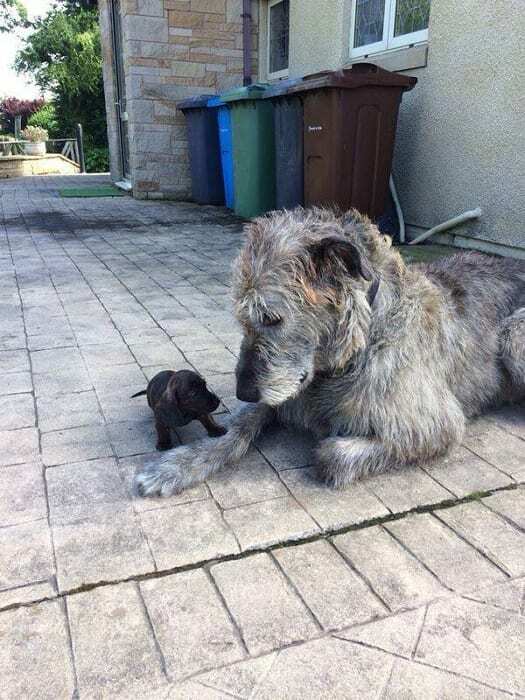 This Irish Wolfhound doesn’t seem to quite know what to do with this wee tiny boy. Why is it so small, why are its ears so big, and why isn’t it fluffy? The little guy doesn’t seem to have nearly as many questions. He just wants to give the big dog a cuddle. 17. Need a side-by-side comparison? 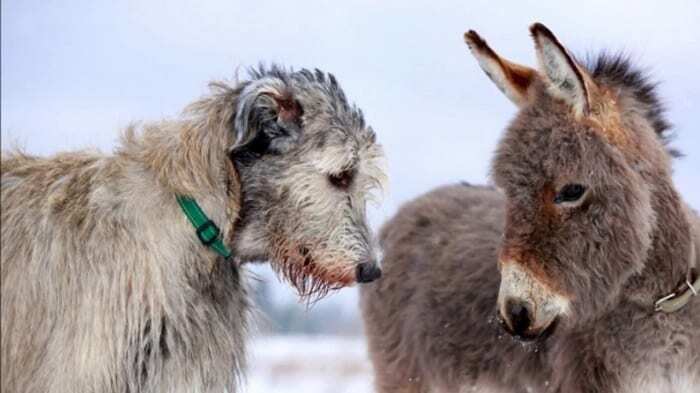 If you need another reference for just how big these dogs can get, check out this one standing beside a donkey. 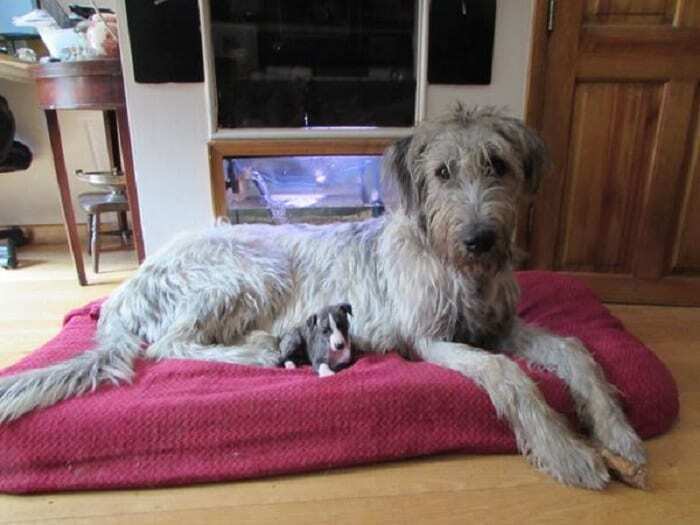 The two of them are the same size; in fact, the Irish Wolfhound looks like it may even be a bit bigger. Now imagine that guy running at you in the middle of the night! 18. And here’s another reference: an entire couch. Yes, these dogs are absolutely enormous. This one takes up the entire couch, so don’t think about trying to sit down while he’s in the middle of his nap. But the best thing is that scattered around this big old dog are all his favorite stufties. 19. Hey Dad, turn around! Whatever this owner is making for himself, he’s got quite the surprise when he turns around. 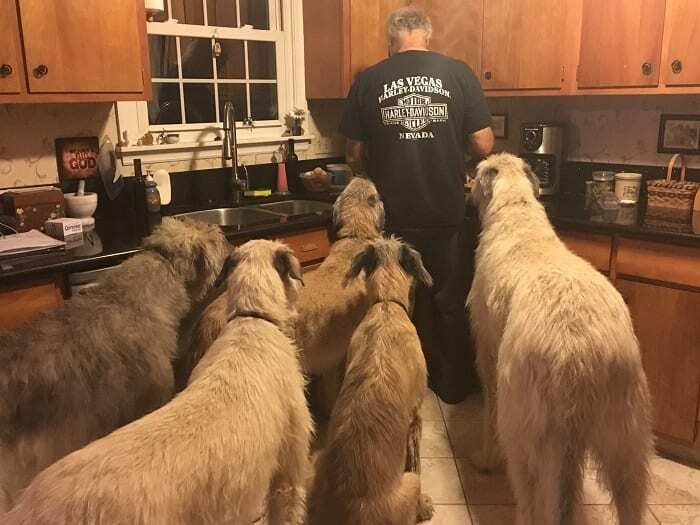 There are five hungry, enormous dogs waiting to get a bite. 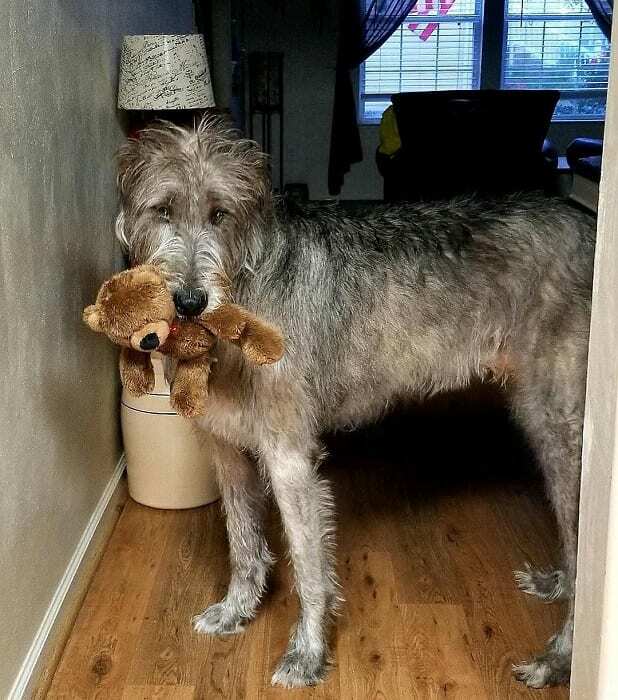 The poster says that his snack involved peanut butter, which Irish Wolfhounds apparently love. 20. This big pup wants to snuggle with his mom. 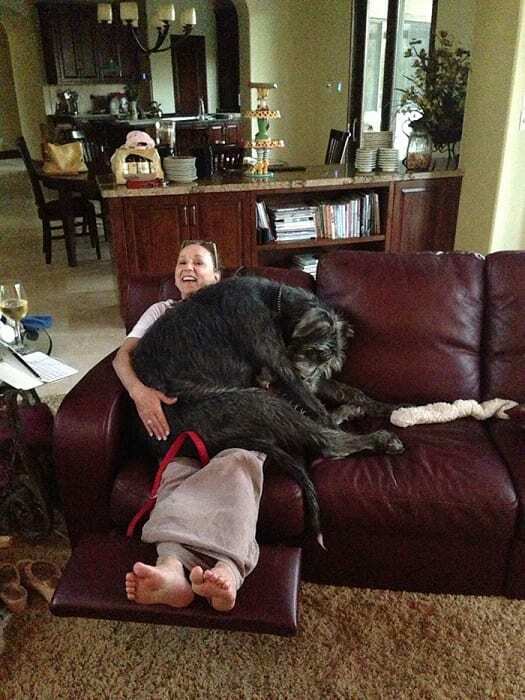 He may be a big dog, but when it comes to mom, he still wants to crawl into her lap. Hopefully, his mom’s lap can take all that weight, because he does not look like he’s planning to move. Mom might be laughing, but she’s probably also mouthing “Help me” to the camera. 21. If you don’t have a blanket, use an Irish Wolfhound. This dog is enjoying a warm cuddle in bed with his human friend. They have plenty of pillows and blankets, but it looks like they won’t need them at all since they can just snuggle up together for warmth. You won’t find a softer blanket in any store! 22. They might be big, but they’re not always so tough. This big guy has a fear of thunder, so when he heard a storm brewing, he ran straight to his mom. Sure, his running might shake the house as much as the thunder does, but what’s it to you? He didn’t feel safe unless he was getting snuggled. 23. This kitty has no fear. 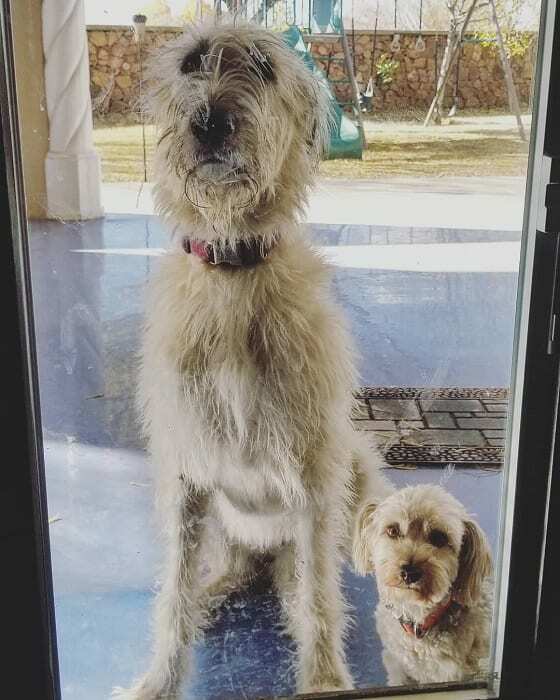 She only weighs 3 pounds while the Irish Wolfhounds weigh 180 pounds apiece, but she isn’t afraid. This adorable kitten loves to nap between her two canine brothers, snuggling up to their furry warmth. What better place is there for an itty-bitty kitty to catch a snooze? 24. These two furry guys love to run fast. If you want to really be amazed, these two dogs are only 18 weeks old. That’s only four and a half months — they’re still puppies! But they’re already absolutely enormous, from their heads to their huge furry paws. Just to make them even more adorable, their names are Jazza and Gandalf. 25. 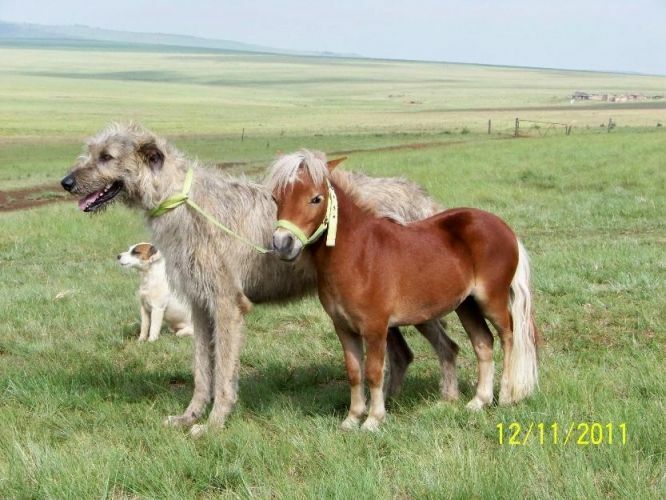 Smallest horse, meet the biggest dog. Okay, that dog doesn’t have any actual title, but the horse is Minnie Mouse, of Hertfordshire, United Kingdom. 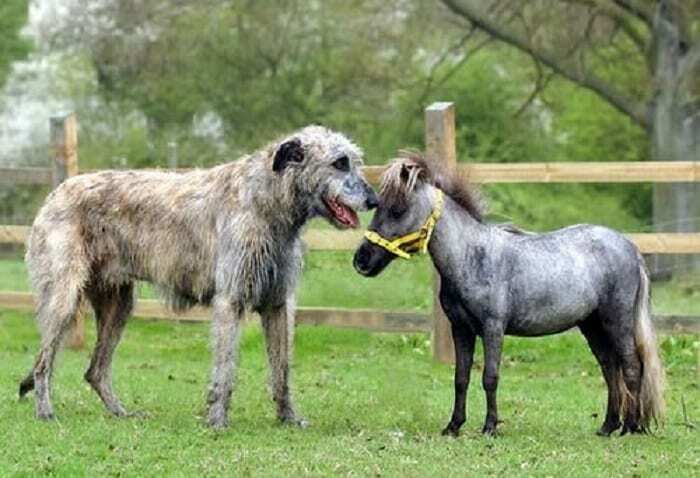 She claimed the title for Britain’s smallest horse at only 21 inches tall. Here she is saying hello to Fergus, an Irish Wolfhound who towers above her, back in April 2005. 26. Oh, are you impressed by my tail? When you’re that big, everything about you is big, from the nose down to the tail. 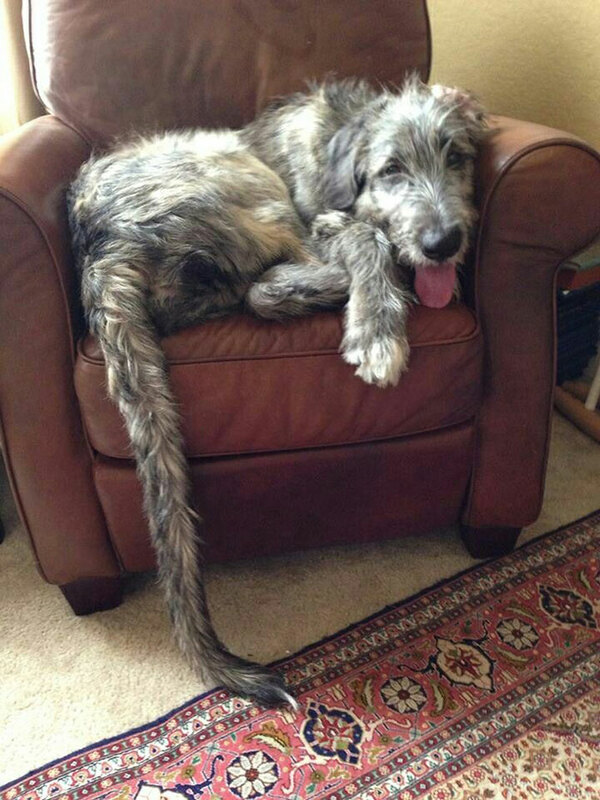 This Irish Wolfhound is showing off his long, luxurious tail up close. From the armchair cushion, it reaches all the way down to the floor. That must make for some seriously dangerous wagging. 27. Little car, big dog. 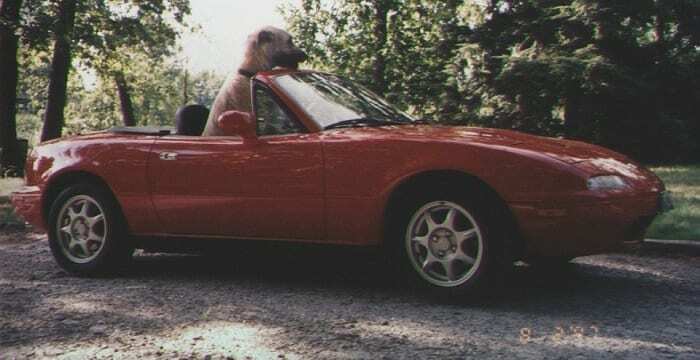 This dog looks almost comical behind the wheel of this tiny sports car. But hey, he’s a dog, it’s a car … dog and car rides go together like peanut butter and jelly. The best part is that in this car, there’s no need to hang his head out the window. The whole thing is a window! 28. Well, I guess we’re standing at the vet. 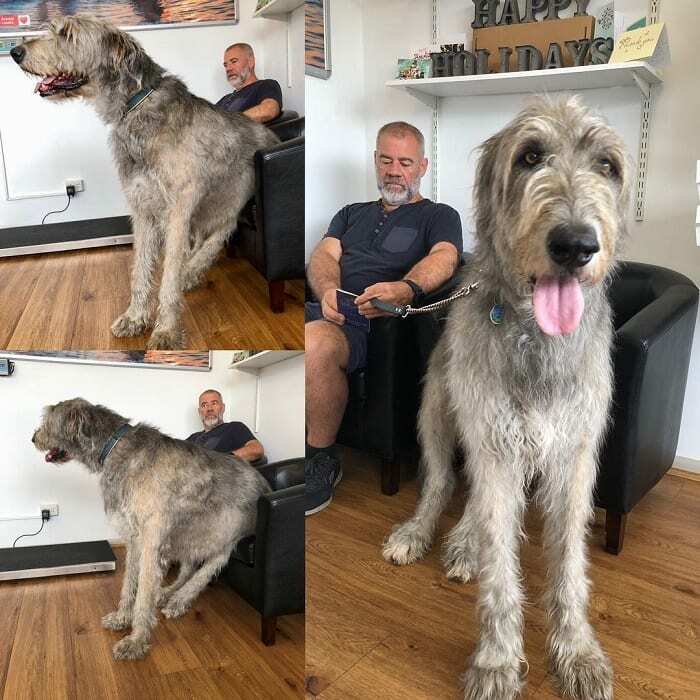 This Irish Wolfhound had an appointment with the veterinarian but there was some bad news: the office didn’t have any chairs that were big enough to support him. He tried a couple different positions but ultimately had to stand. At least the vet made it up to him with some treats! 29. There’s nothing like snuggling up on the couch. This Irish Wolfhound looks perfectly happy to cuddle up to this lady on the couch. 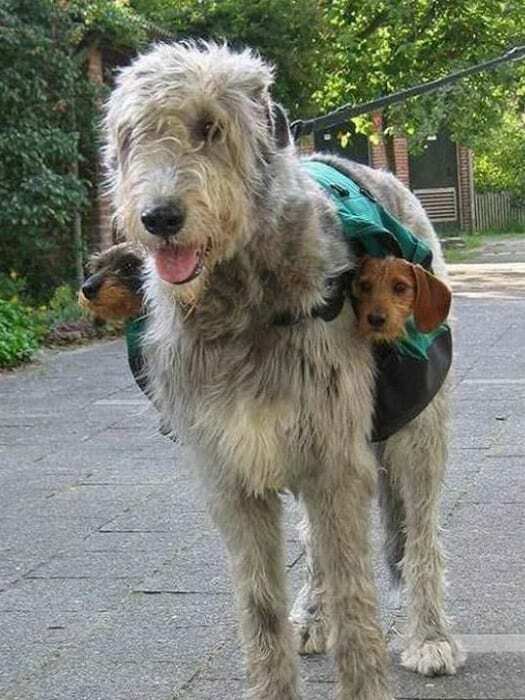 Of course, the dog can barely fit but he doesn’t seem to mind at all. Hopefully, the lady can handle having all that dog on her lap — and hopefully, the couch can handle the weight! 30. Who said this was your couch? This is my couch. 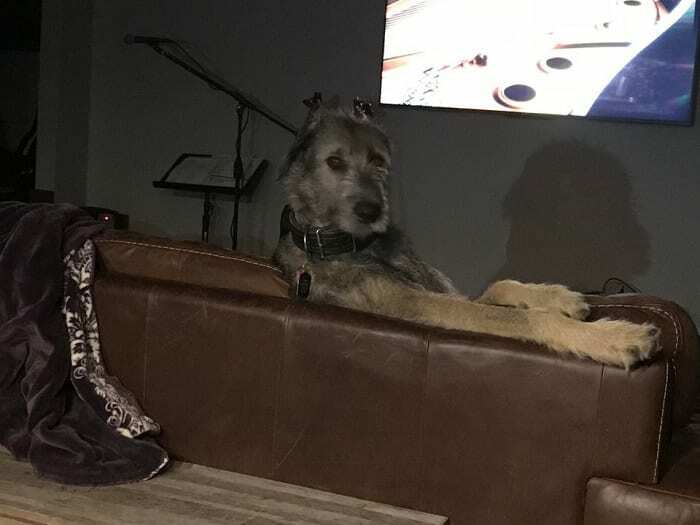 This enormous Irish Wolfhound (whose name is Janine, by the way) has taken over the couch, and she’s not planning on giving it up. She has something playing on the television and she’s settled in and comfy. But hey, human, you can go join her if you want. 31. These two are partners in crime. 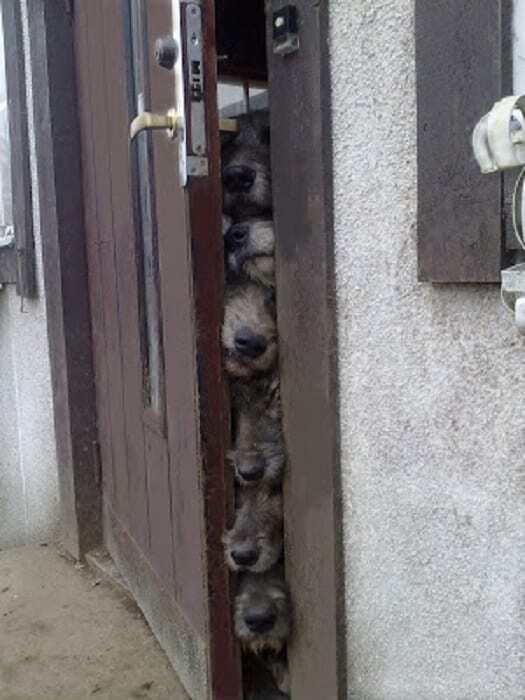 These dogs want to come back in but their owners won’t let them just yet. Their solution is to stay exactly where they are and stare plaintively until one of the humans gets the message. Between the cuteness of the two of them, someone is bound to cave. 32. She might not look great, but she sure is comfortable. None of us can control how we look when we sleep, and as a result, things sometimes get pretty goofy. Whether it’s sleeping in odd positions, snoring, or, well … lolling with our tongue out and our nose in the air, everyone has an odd sleep habit. Just own it, puppy, and enjoy your snooze. 33. Dad is 6-foot-1, so do the math. This man is just above 6 feet tall, so you can only imagine how tall the dog is. He looks like he’s almost knocking him down as he puts his weight on the man’s shoulders. 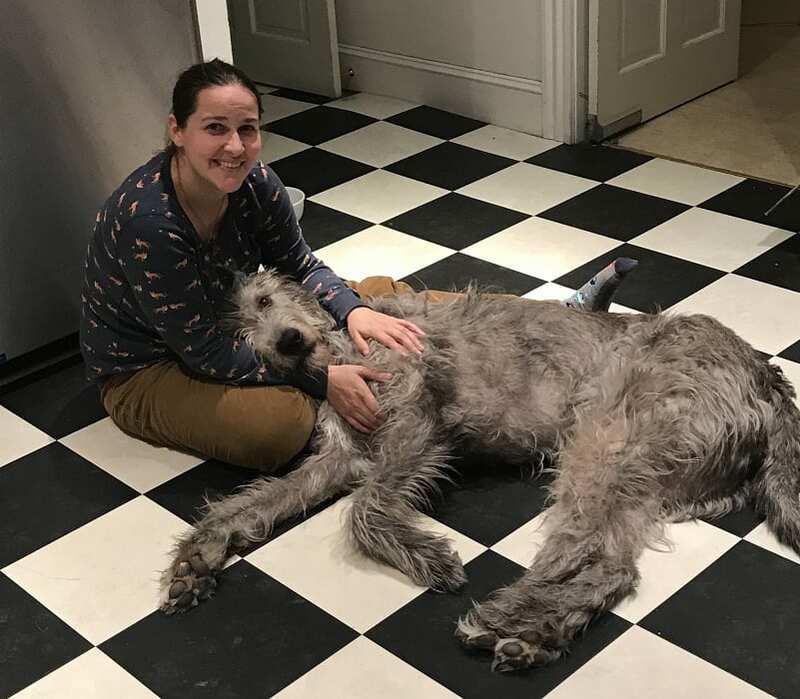 By the way, that Irish Wolfhound (whose name is Conagon, if you were wondering) is only 2 years old, so he has plenty of growing left to do. 34. The question is, who’s in charge here? This little girl has a lot of confidence for someone who’s up against such a big dog. She herself is tiny, but her big grin says she’s done this many times before. 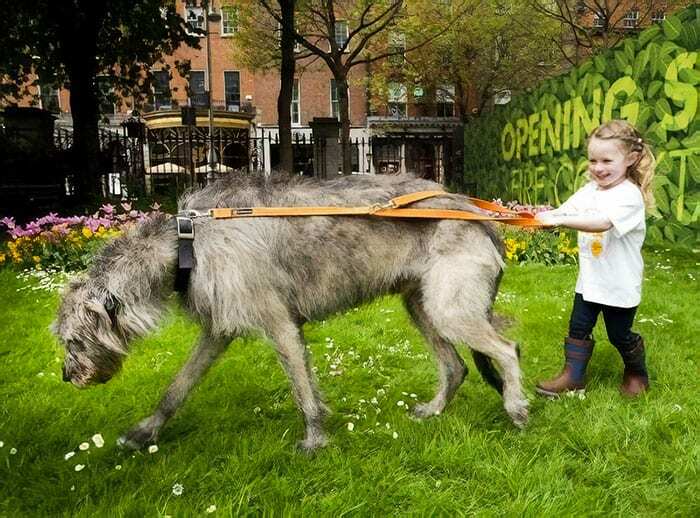 Heck, she’s probably even grown up with this Irish Wolfhound by her side. To her, he’s just part of the family. 35. Can you believe the contrast between these dogs? 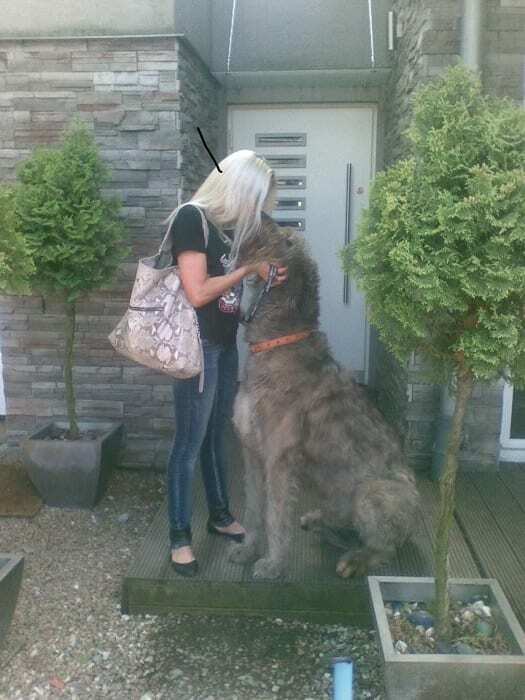 Someone in this house thought it would be a good idea to bring a new friend home … for their enormous Irish Wolfhound. So far, the introduction looks like it’s going well. The two pups are exchanging a friendly sniff hello. Just keep an eye on the new puppy for a while: he’s only one mouthful for the other dog. 36. It’s important to get your daily workout. 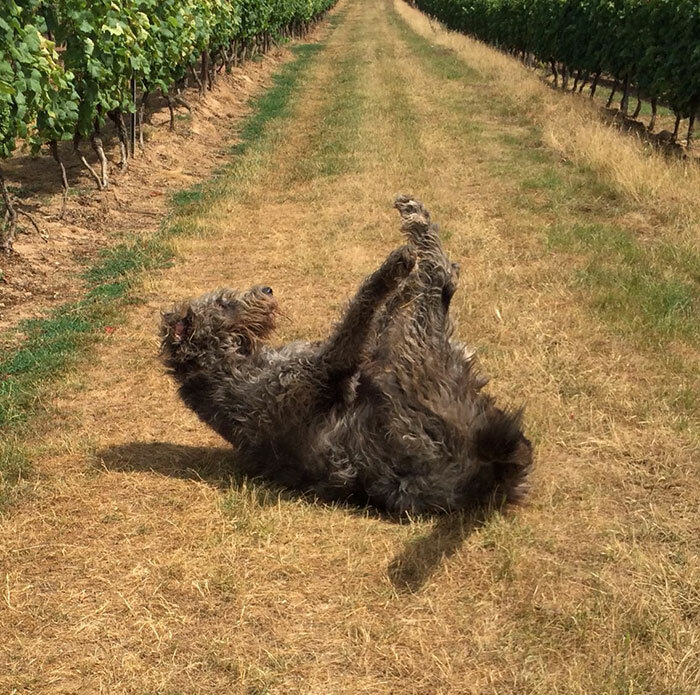 This dog is surprisingly flexible for such a big animal. He can even touch his toes, which is pretty impressive. There’s nothing like doing a workout routine in the orchard with your tail wagging in the sunshine. After you’re done, a nap on the front porch is calling you. 37. These dogs have their very own water fountains. 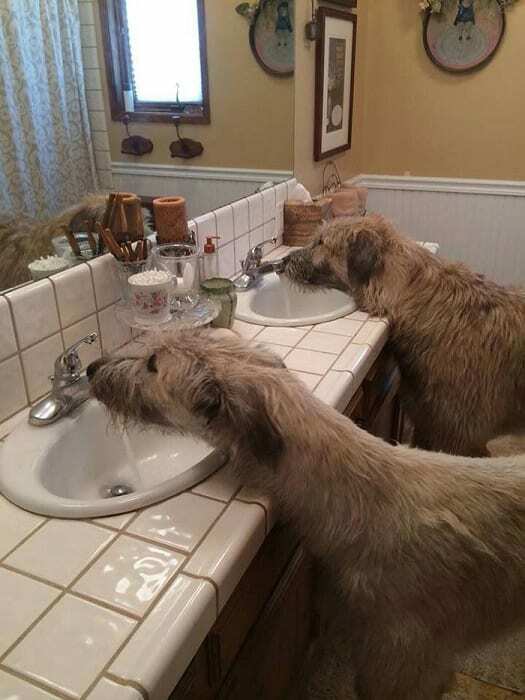 These two friends have no need for doggie dishes — they have custom water fountains right in the bathroom. 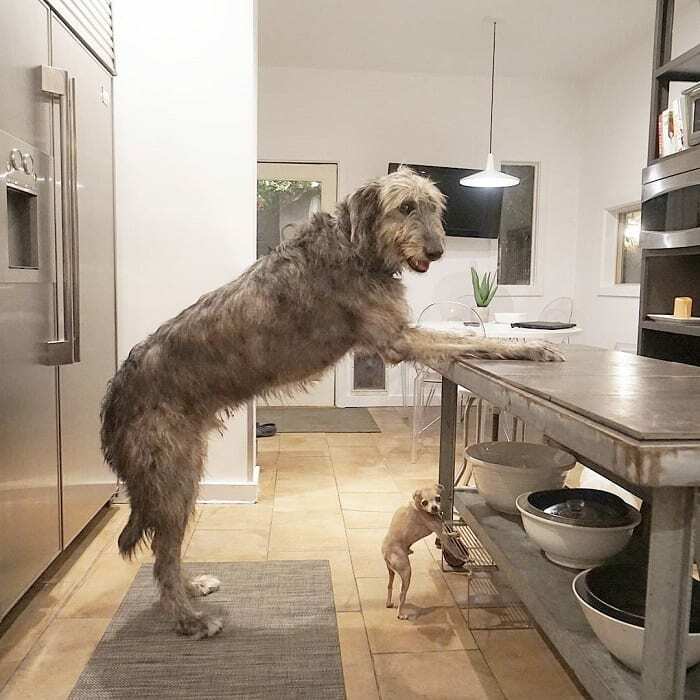 OK, they’re actually just regular sinks, but the dogs are so big, they can reach them easily. They look pretty happy to have a running faucet to play in. 38. Now mush, friend, mush! 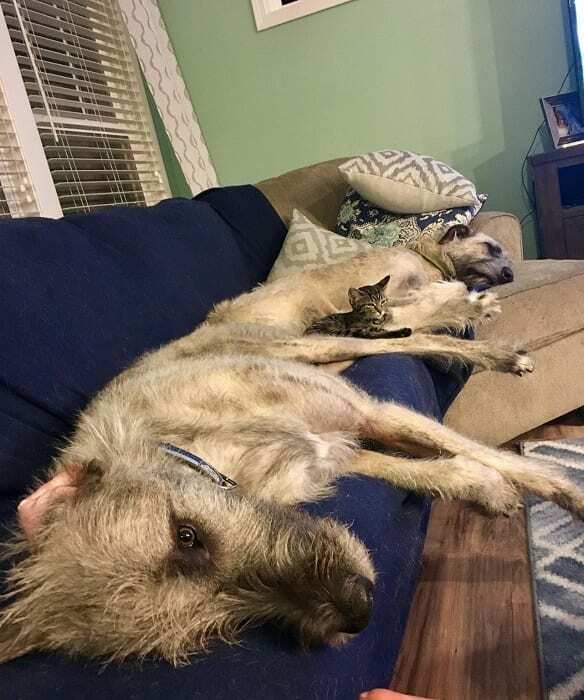 These three partners in crime are the best of friends, and not just because the Irish Wolfhound (whose name is Driller, by the way) is big enough to give them rides. He also makes a great bed for them to lay on, with his long fur and big, soft, warm body. Coco and Chanel love to snuggle up to him.